How was this year’s growth season, everyone? The last couple of months have been great planting weather! One could not have asked for better days … intermittent rain periods in between beautiful summer days. The seasons they are a’changing. Time for some maintenance around the Nursery. Recently we have trimmed the vegetation around the perimeter fence and removed some temporary shade areas to let more light in to the nursery as the days grow shorter and the sun sits lower in the sky. Other maintenance includes drainage works around our potting shed to reduce moss, algae and ultimately slip hazards. This involved laying of new ag pipe and spreading of some fresh gravel. One maintenance issue picked up by one of our trainees was dry spots in the seed tunnel. Often when we have days of wet weather, we reduce the irrigation cycles in the nursery. This helps us save on water costs, but we have to pay special attention to the cuttings bench as the cuttings often don’t respond well to getting too dry. We have installed a new micro-controller which stays on even when the whole nursery power is turned off or reduced. With the regular rain we have managed to avoid the use of town water supplied irrigation for approximately three weeks. We still have room for improvement in efficiencies, but cost savings are starting to show. I would like to commend Sam Bielby for his efforts in keeping the Bio-facility looking shipshape. Sam has now focused his talents on propagating biological control agents for Cat’s Claw Creeper. On a sad note, we have parted ways with two big personalities in the nursery: Steve Blight and Linda Curson. With a combined experience of 13 years in our nursery, they will be sorely missed. 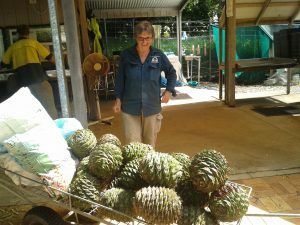 Linda Curson weighing up her options with the monumental task of seed treatment and sowing techniques for our local native Araucaria cunninghamii (Bunya Pine)! The good news is we have had new arrivals in the last few months to the nursery Volunteer team, who have some unique skills to share. They have already been a great help and have given more insight into our tasks and provided opportunities for more efficiencies. Since January this year, Noosa Landcare also has new opening times at our Retail Nursery in town: Tuesday to Friday 9:30am to 3:30pm and Saturday 9:00 to 12:00. Wildlife so far this year in the nursery: one Brown tree snake, two Pythons, one Antechinus, many Brush turkeys, one Pee wee (whose name is Sebastian – our Nursery mascot and friend). 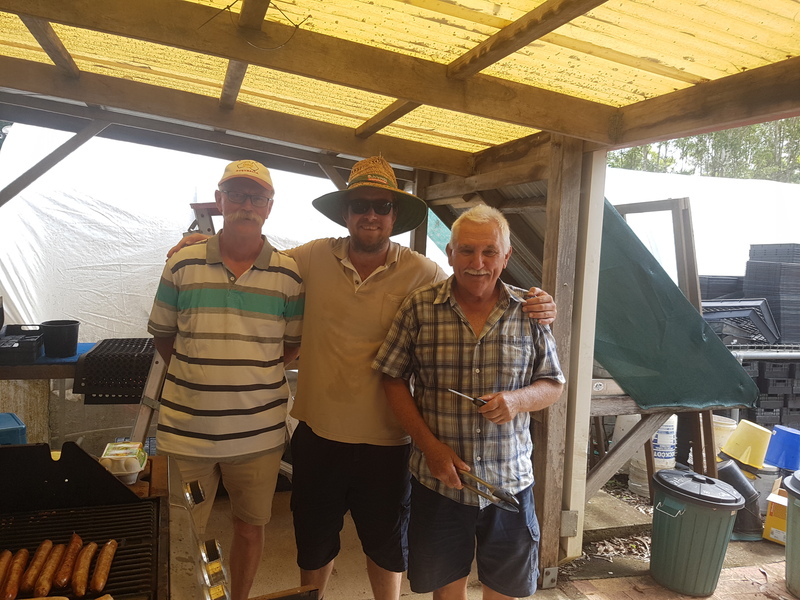 Main photo: Ered Fox (Nursery Manager, middle) with volunteers Gerry (left) and Steve (right).